Using Final Fantasy XIII to promote TVs. 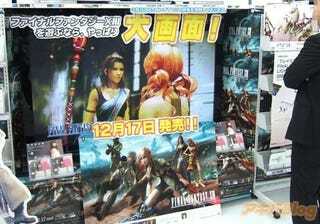 Sofmap, a Japanese retailer with stores in Tokyo and Osaka, has a Final Fantasy XIII display up at its main store in Akihabara. The FFXIII trailer is being looped on a big screen HD television. In Japanese, the sign reads, "If you're playing Final Fantasy XIII, then of course big screen!" If anything is going to get those Japanese gamers who haven't yet embrace HD gaming, it's going to be Final Fantasy XIII.